It’s easy to keep active in the summer months with so many things to do and places to go. This past summer was a blur. I felt like I never stopped to rest! We are a month into the school year and I’m happy to say that I’m back into my fall routine. For many of us, me included, settling back into our routines is a good thing. However, it does have its downfalls. For starters, we tend to be less active during the colder months. Along with decreasing our exercise, we also indulge in those delicious (but heavy) fall comfort foods. Hello casseroles and pumpkin pie! I’m an IBS sufferer with a sensitive tummy so the combination of these two factors can lead to constipation. I have to really watch myself or else suffer the consequences. Constipation, as I’m sure you know, is no fun at all! I find being proactive about my digestive health helps a ton to staying healthy, regular and most of all, comfortable! 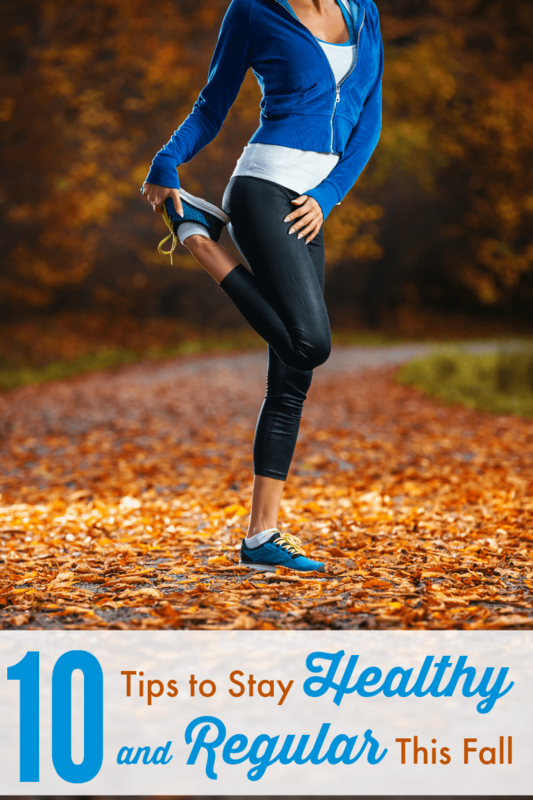 Here are ten simple ways you can prevent constipation this fall season. 1. Eat foods with lots of fibre. Add lots of fruits, veggies, legumes and grains to your daily meals. Your goal should be to consume about 20 to 30 grams of fibre a day. Right now, I’m addicted to grapes! They are a healthy snack that satisfies my sweet tooth. 2. Look for fruits rich in pectin. This soluble fibre is found naturally in apples, strawberries, lychees and pears. It has the important job of adding bulk to stools and easing passage. Apple slices with a little bit of peanut butter make a yummy midday snack. 3. Don’t forget about pre and probiotics. I think of them as the good gut bacteria that have a slew of amazing benefits including digestive health. They are found in foods like yogurt, kefir, bananas, whole grain breads and honey. 4. Water, water water. Make sure you are drinking lots of water every day. Staying hydrated is key to feeling great. Personally, I have to work on drinking more water because it’s so easy to just grab another cup of coffee. 5. Skip greasy foods. Say no to foods that are high in animal fat and fried. Your tummy and waist line will thank you. 6. Hold the sweets. Limit your intake of refined sugars found in sweets and rich desserts. Moderation is key. 7. Exercise regularly. Strive for 30 minutes of exercising a day. Some ideas are going out for a walk, going to the gym, joining an aerobics class or running on a treadmill at home. I personally like to bundle up and head outdoors to walk around our neighbourhood. 8. Eat at regular times. Establish a meal routine and stick to it! We tend to have our meals around the same time every day and it does help quite a bit. 9. Manage your stress. This is key for me because stress affects my digestive health in a big way. Remember to take time for yourself every day and do something you enjoy and relaxes you. For me, it’s reading a book before bed. I do it every night. 10. Get relief. Sometimes despite our best efforts, constipation happens. In this case, try Dulcolax® Laxative tablets for gentle and predictable overnight relief. Ask your doctor or pharmacist about it. Dulcolax® has a special promotion going on right now at major retailers across the country until the end of October. 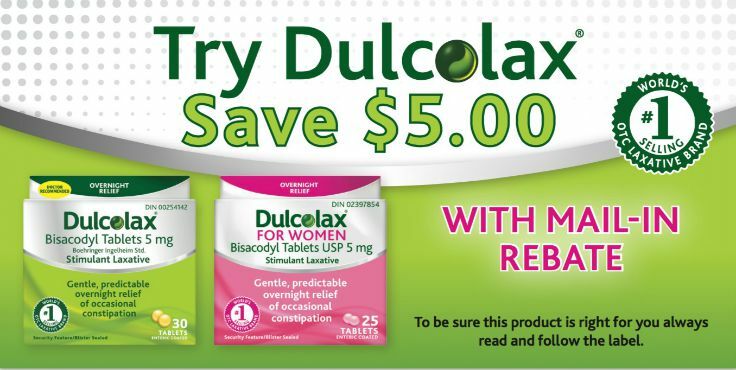 When you buy Dulcolax® or Dulcolax® for Women Laxative tablets at your local pharmacy, pick up a $5.00 rebate coupon and mail-in for redemption. How do you stay healthy and regular in the colder months? So many people underestimate the amount of water they should be drinking. It is so important for us – inside and out. These are great tips. One of the biggest things in staying regular is drinking lots of water. If you’re dehydrated EVERYTHING gets out of whack. Because of the issues I have with my tummy I am hyper aware of what I put in my body. I follow a lot go these steps, but there are few on here that I have not done yet and will be trying. These are some great tips! I have some baby weight I really need to lose. Fiber and water have definitely been a requirement in my diet lately. With the holiday meals coming up I need to do my best to stay fit and regular now because I know I’ll be indulging. I am already starting to feel the creeping in of seasonal depression. I need to get myself into a routine. I love the fall season, can’t wait for halloween! These are some really great tips! I love the avoid greasy foods… That is my big problem and I need to follow that! I try to get enough water and have a great breakfast. I’m terrible about exercise in the Winter though. I am all about the Pre and Pro Biotics because I usually have the opposite problem many foods do not agree with me. At home I can stick with the few that do but traveling is another story. I did use Dulcolax after surgery and it really helped get things working again. #7 and #9 are the toughest for me. Come to think of it, maybe if I did 7 more, I wouldn’t have such a problem with 9! Thank you for the great tips. When I don’t eat right, I get “unregular”. I knew most of these tips, but looking for foods that include pectin to help stay regular is new to me. I never thought about that before, but it totally makes sense. Now I have even more reasons to enjoy my favorite fruits! Trying to do #7 better but it is still hot here to do more! This is good advice. I need to start with my hydration. Diet sodas just don’t cut it. My husband suffers from constipation sometimes! I’ll definitely be sharing these tips with him! These are awesome tips that can be applied all through out the year. I ditched the soda and other sugary drinks and I’ve been drinking lots of water. I have been wanting to start taking probiotics. I like to take extra Vitamin C when the weather starts to get colder. These are great tips for staying healthy in the winter. I try to drink extra water in the colder months. Yoga is a great way for me to stay in shape. I try to up my intake of fruit, vegetables, and water. I need to cut out sweets too. Exercise needs to be a priority for me! As I am getting older, I know I have to increase my fluids, and oh boy!! say away from the greasy food. Love this post! I have a run planned for tomorrow! 🙂 yay me!! !